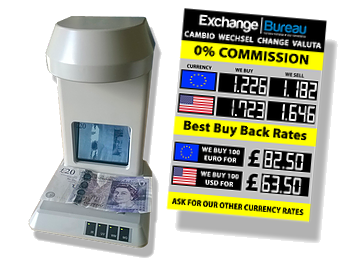 Exchange Bureau RETAIL user gives you all ability to convert currency to cash (GBP) for your customers OR passing trade. BUY Currency notes from your customers (and passing trade) with our easy to use online system. HOTEL USERS can make a profit margin of between 3% & 5%* for every WE BUY currency transaction from customers for cash (GBP). THE TRUTH IS, IT'S ENTIRELY UP TO YOU, HOW WELL YOU DO. Access through login to your own account with our easy to use transaction templates. Access to our FULL SUPPORT system, with information on every topic you would ever require. PRINT transactions for your customers using either an A4 printer or a POS receipt printer. EMAIL TRANSACTIONS directly to your customers email address, so you don’t need to print or write a transaction. CURRENCY CHECKER to verify ALL the currency notes that you buy from your customers. This top of the range device uses and INFRARED CAMERA and a mini LCD screen. ADVERTISING and SUPPLIES needs are totally covered with a range of posters and our discrete Hotel Plaque. 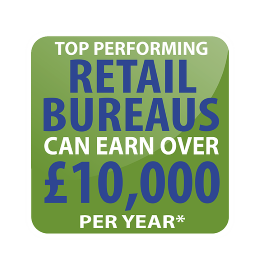 WE PAY for your Bureau de Change license as part of your membership fee and provide full COMPLIANCE MONITORING, TELEPHONE and EMAIL SUPPORT. SAVE on cash (GBP) banking costs, if given out for currency transactions.